The premier dog therapy centre in the North East of Scotland. K9 Hydro Centre is an established, family owned facility, devoted to canine exercise, performance and conditioning. We are committed to working with you and your Vet to ensure the best possible treatment to help your pets enjoy a full and active life, whether they are recovering from surgery, injury, illness or maybe just needing to keep fit or lose a little weight. We work beyond UK regulations and codes of practice to ensure we provide the highest quality service to dog owners. 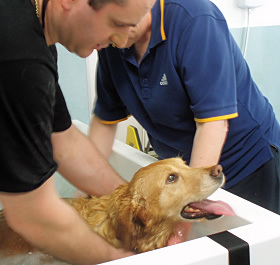 By developing and implementing practices and procedures above industry standards, Veterinary Surgeons, Pet insurance companies and most importantly pet owners can be confident the treatment received at the K9 Hydrotherapy Centre is the very best available. K9 Hydrotherapy is not an alternative to veterinary medicine and care. We will not diagnose or prescribe for any condition. We recommend that clients having any concerns about the health of their animal consult their primary care Veterinarian. Please call 01224 782717 for more information.